The Fellowship actively participates in the work of the Unitarian Universalist Service Committee (UUSC), which advances human rights and social justice around the world, partnering with those who confront unjust power structures and mobilizing to challenge oppressive policies. The UUSC envisions a world free from oppression and injustice, where all can realize their full human rights. Standing on the Side of Love is a public advocacy campaign that seeks to harness love’s power to stop oppression. It is sponsored by the Unitarian Universalist Association and actively supported by the Fellowship. The Standing on the Side of Love campaign elevates compassionate religious voices to influence public attitudes and public policy. Through community activism, social networking, and media outreach, people across the nation are equipped to counter fear and make love real in the world. 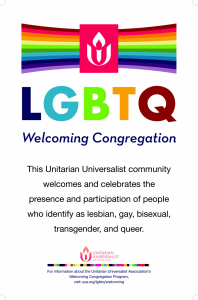 As a member congregation of the Unitarian Universalist Association, we regularly engage in discussing Study Action Issues and creating Statements of Conscience, coordinated through the Commission on Social Witness. Recent statements have addressed peacemaking, ethical eating, and immigration as a moral issue.